Navigation – For ease of navigation, the user interface and menus have been standardized for all modules, including budgeting, costing and payroll planning. If you are using the budgeting module and decide to use the costing features (or vice versa), you don’t have to try and navigate through an new interface. You can customize the interface by moving or hiding columns, displaying menus in French or English and changing the on-screen font size. Customized screen – we have increased the font size, hidden the Detailed column, inverted and changed the size of some of the columns. Copy/cut and paste – You can easily copy/cut and paste information from an application such as Excel, Word or Outlook, etc. to the Decimal Suite, and vice versa. You can of course perform any of these operations within the Decimal Suite itself. Hierarchical structure – After you have entered your hierarchical structure’s parent/child relationships, you can create reports according to the desired hierarchical level. You can also add and remove levels depending on the type of analysis required. Classification – Classifying your accounts allows you to recreate the layout of your financial statements. 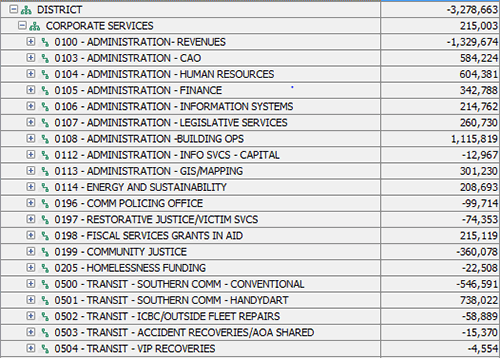 Once you have selected a hierarchical structure and a classification, financial statements will be displayed by responsibility centre budget, or by any desired hierarchical level. 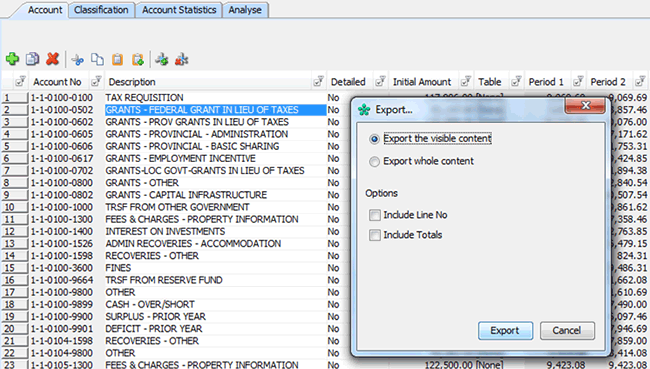 Ad hoc reports and analysis – You can use the Pivot Tables right in the Decimal Suite to create ad hoc reports and analyses. These Pivot Tables have similar features to the ones in Excel: for example, you can apply filters and sort the table columns as you can in Excel, and create different types of sub-totals, (sum, average, etc.). Also, you can save the report or analysis layout so you can quickly and easily redisplay those documents at a later date. This feature means that analyses can be created and shared with managers. The data that is displayed will vary depending on the manager’s access to information, but the structure will remain intact. at a predetermined time (daily, weekly, etc. 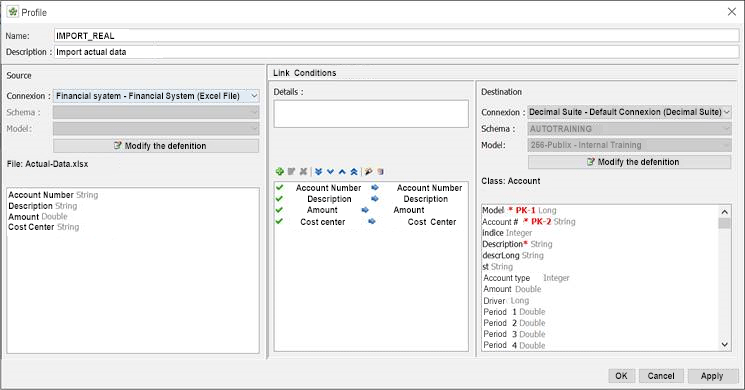 ), automatically read the data in your operational systems and import it into the Decimal Suite. In many cases, users could also simply copy/cut – paste the entry screens. They can also quickly and easily export full screen content (including hidden columns) as well as only visible screen content (conforms to applied filters and exclude hidden columns). You could also create an ODBC link between a software application, such as Excel or PowerPoint, and your database. The data in Excel, PowerPoint, etc. will be automatically updated when there is a change in the identified database. Eliminates the need to re-enter data – There is no need to re-enter data if you are simultaneously working in both the budgeting and the costing module. For example, when you import your Chart of Accounts into the Decimal Suite, that data is immediately available in both the aforementioned modules. Security – It is possible to restrict or block user access to data. For example, the system is generally configured so managers can only access their own cost centres. However, an executive may have access (in read-only mode) to all the cost centres under his or her control. It is also possible to freeze or hide certain accounts that only Finance can modify. It is also possible to prevent specific budget items from being entered. This feature enables Finance to centralize the calculation of certain costs (for example, it could allocate an amount of $500 per full-time equivalent per year for telecommunication costs) and to ensure that managers cannot change that amount. The Decimal suite contains multiple environments, all of them simple to manage. Finance can easily transfer data between the different environments without losing data integrity. These multiple environments are useful for conducting training or performing different tests before allocating production data. An audit module makes it possible to track the changes made by different users. In fact, it provides information such as what changes were made, the date and time they were made, the user responsible, the value before the change was made, etc. An administration module designed to create users and data sets is easy to master and requires no IT assistance, thereby increasing the independence of the Finance department.